Forget costly consultants and masterplanners, if you want innovative and creative ideas for Rotherham town centre, just ask the borough's schoolchildren. 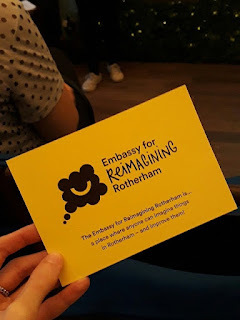 This year, the "Embassy for Reimagining Rotherham" tasked 30 local children and young people with planning out the future development of Rotherham. It started life in August, when a group of 7 – 14-year-olds were assembled by Grimm & Co to find out what they wanted from their town. Opening in a former pub in Rotherham town centre last year, Grimm & Co is an Apothecary to the Magical that sells wild schemes, evil plots, charms, curses and kitchenware. It was recently voted "No. 159 best shop for all things wicked" by Witch? magazine. An intensive three-week writing programme was hosted, during which time the children and young people drafted a manifesto for their town's future. The drafting process involved the young people thinking about and discussing what the town would be like if they were in charge, reflecting on the things in Rotherham they already liked and wanted to keep and what Rotherham didn't have that they thought was important. The group also took part in fun activities designed to get them thinking about broader concepts like money, the economy and social inclusion and how they could be made fairer and better in their vision of Rotherham. They also took over a vacant shop in the centre of Rotherham and turned it into the Embassy for Reimagining Rotherham. From here they consulted with local people about their manifesto and incorporated their feedback. Sarah Christie, creative learning manager at Grimm & Co, said: "It makes me feel incredibly positive about the future of Rotherham. The young people we worked with were passionate about their ideas and their town. All the children and young people had a deep sense of fairness, and the top priorities in their manifesto were all around ensuring that there are equal and accessible opportunities for all. They also strongly valued the environment and access to green spaces and the outdoors, and thought deeply about what they wanted from their education (which included more time at school, and more practical lessons, such as in first aid and cookery). "It also showed me just how thoughtful, insightful, and capable of debating "big" ideas children and young people are. We discussed the economy, models of government, the education system, and much more – and even the youngest children, who were only seven, had thoughtful, original, sensitive responses to these topics. The participants also loved debating and discussing these issues. Children and young people shouldn't be underestimated!" The initiative helped to develop the confidence, self-esteem, writing skills and imagination of those taking part. 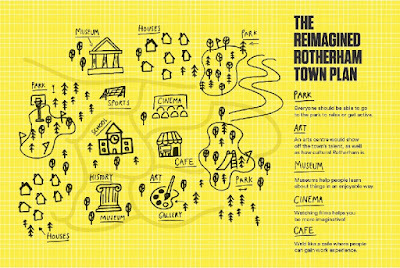 The recently published manifesto, professionally designed by Side By Side, contains all of the ideas about how to make Rotherham a more interesting and inclusive place. For example: "There should be a children's gallery where you can see children's work. In the gallery you could doodle and it would be displayed in the doodle hall. You could also talk to the artists and tell them your ideas." Other ideas range from a communal garden to free flying cars powered by clouds. Deborah Bullivant, founding director at Grimm & Co, said: "Some of the adults were coming up to me and asking: "Did the kids really create that?" Yes! We are completely child-led, it is a big thing for us. We are very ethical." The project was supported by Arts Council England, Julie Kenny CBE DL, the University of Sheffield, IVE, Rotherham Council and Big Lottery. Grimm & Co hosted a Christmas gathering of the Rotherham Pioneers this week. The exclusive group for Rotherham businesses who want to promote the town, celebrate all that is good, and grow the Rotherham business community was created following on from a major exercise focused on using "The Rotherham Story" as a way of promoting the borough. Jackie Freeborn, place manager for the Rotherham Pioneers, said: "For those of you who haven't had chance to visit Grimm & Co yet, I truly recommend that you do so in 2018, it is an amazing example of a Pioneer "Pushing Boundaries," daring to be different, making a huge difference to children, and attracting visitors from inside and outside of our town."